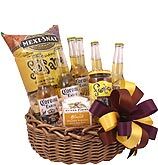 Created in Mexico with a refreshing hint of lime, Corona Extra is the perfect way to touch someone special when you can only get there in spirit. This pale lager is often enjoyed on the beach or poolside, but it's also a powerful way to seal the deal on a great accomplishment or simply a great day. Thank You for your awesome service. I bought this basket for a buddy who was moving into a new apartment and he loved it. He commented on how good the snacks presentation and was. Thank You! Hi, I just wanted to thank you for the awesome service.I am from India ordered it for a friend who stays in Connecticut. I must say it was impressive, beergifts made it to him on time. Each individual treat was taken down to the confetti in order to separate it out so that they did not Mingle with the beers. This gift was well presented and Well-packaged. He sent me pictures and he is very happy with it. The card inside was so Tastefully done. Thank you once again. My sister and I sent this to my dad for Father's Day. We bought it like 5 days before and it arrived on time !! I was so happy because I didn't think there was anyway it was going to make it. He loved it !! 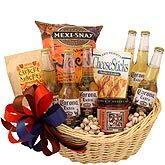 I will say I wish the price were a little lower because I would send these for all guys occasions lol. Thank you ! I went as a gift and they loved it. The beer arrived cold and everything was fresh. I would order again!!! 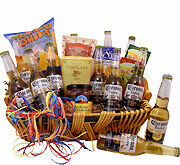 The fathers' day beer gift baskets are affordable, easy to shop for, and delivered quickly. My nephew loved this for his 21st Birthday!